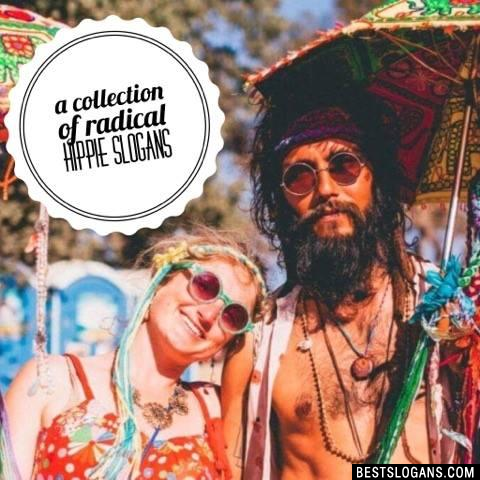 28 new entries added to hippie slogans, that include pictures. 1. Right On! 3 If it feels good do it. 7 Jump the lines, man! 14 Sock it to me. 15 Bring it home, daddy-o. 16 Yesterdays just a memory, tomorrow is never what its supposed to be. 17 I'll let you be in my dreams if I can be in yours. 18 Drop acid not bombs. 19 Power to the People. 20 Never trust the man. Can you think of a good Hippie Slogans we're missing? Or come up with a clever one of your own. Please share below.